Following on from the beard oil, I have been using The Beardy Beard Co Dark & Stormy Beard Balm. I was sent the Dark & Stormy products in The Northern Irish Beard Care Kit which is a tin containing a 10ml beard oil and a 15ml Beard Balm, but the balm is also available in a 60ml tin. The Dark & Stormy scent is a blend of Ylang Ylang (cananga), Lime, Ginger and Bay rum essential oils. I had said in the Dark & Stormy oil review that I was getting a scent that I thought was the rubbery like scent that you can get from the Ylang Ylang and yet Gail had used the Cananga variety that doesn’t give that rubber note. After chatting with Gail she thinks it may be the Ginger with the Bay Rum and unfortunately this balm with this scent is not for me! However I can appreciate a scent blend even if I do not like it! The Dark & Stormy scent has been blended nicely, the various scents all compliment each other and no scent is at a ratio that is to the detriment of the others. The base for this balm is Beeswax, Grapeseed Oil, Sweet Almond Oil, Jojoba Seed Oil, Shea Butter, Cocoa Seed Butter and Hemp Seed Oil. I have enjoyed using the balm, my beard has felt softer, it gives a very nice hold and my beard (even if I do say it myself) has been looking really good! 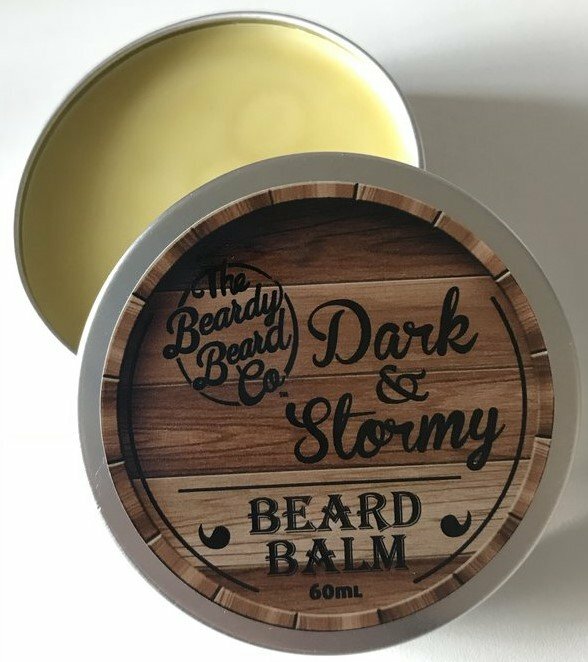 The 60ml tin of The Beardy Beard Co Dark & Stormy Beard Balm costs £15.95 from the website and the Dark & Stormy Beard Kit costs £14.95 from the website.